2012-01-06. New. Ships with Tracking Number! INTERNATIONAL WORLDWIDE Shipping available. Buy with confidence, excellent customer service! P. G. WODEHOUSE: METHUEN'S LIBRARY OF HUMOUR. WODEHOUSE, P. G. P. G. WODEHOUSE: METHUEN'S LIBRARY OF HUMOUR. Edited by E. V. Knox. London:: Methuen & Co.,, 1934. First edition [of this selection] [McIlvaine B3A]. . A very good copy in very good dust jacket; jacket has a piece missing front panel (1 by 1 3/4 inches, at top edge), two long closed (and barely visible) tears on the front panel (circa four inches), and a browned spine. . Sixteenmo, orange-brown cloth, pp. vi, 154. Edition: First edition [of this selection] [McIlvaine B3A]. New York: Pierpont Morgan Library, 1981. First Edition. As new in dust jacket. Condition: First Edition. As new in dust jacket. UK: Heron Books, 1000. Hardcover. Very Good. 8"x5. From Heron Book Collection. 19 volumes in complete set. 2 volumes missing, which is reflected in the price. Faux red Morocco binding with gilt decoration. Silk ribbon on each volume. Some rubbing to tip and tails. Most volumes are tight and clean. 1/ Aunts Aren't Gentlemen & Uneasy Money 2/ The Mating Season & Jeeves In The Offing 3/ The Luck of the Bodkins & Big Money 4/ Leave it to P. Smith & Summer Moonshine 5/ Ukridge & Nothing Serious 6/ PSmith In The City & PSmith Journalist 7/ Heavy Weather & Service With A Smile 8/ Meet Mr. Mulliner & Mr Mulliner Speaking 9/ The Inimitable Jeeves & Ring For Jeeves 10/ Uncle Dynamite & Cocktail Time 11/ Very Good Jeeves & Thank You Jeeves 12/ Spring Fever & Pigs Have Wings 13/ The Heart Of A Goof & Indiscretions of Archie 14/ Love Among The Chickens & Eggs Beans and Crumpets 15/ Summer Lightning & Blandings Castle 16/ Right Ho Jeeves & Carry On Jeeves 17/ Laughing Gas & Hot Water. This will require additional carriage for orders outside the UK. 2012-01-06. Good. Ships with Tracking Number! INTERNATIONAL WORLDWIDE Shipping available. May not contain Access Codes or Supplements. May be ex-library. Shipping & Handling by region. Buy with confidence, excellent customer service! Avenel Books. Used - Good. Good condition. Good dust jacket. Avenel Books, 1995-11-15. Hardcover. Used:Good. W. W. Norton & Company. Hardcover. 0393088995 New Condition. . New. Arrow Books. PAPERBACK. 0099514796 New Condition. . New. Hutchinson, 2011. First UK edition-first printing. Hardcover. Fine/Fine. Fine condition.Hutchinson,2011.First UK edition-first printing (2 4 6 8 10 9 7 5 3 1).Grey hardback(gilt lettering to the spine,small dent and nick on the edges of the spine) with Dj(two small nicks,ink mark and crease on the edges of the Dj cover), both in fine condition.Illustrated with b/w photos,drawings.Nice and clean pages as new with a small ink mark and nick on the outer edges.610pp including List of illustrations,references,select bibliography,index.Price un-clipped.Heavy book (approx 1.1 kg). Avenel Books. Hardcover. 0517405385 In Great Condition Hardcover ~ Slightest shelf-wear ~ PRISTINE pictures and text, AU11, |<> different cover art, Your orders are meticulously inspected, packed securely, and shipped ASAP, quick responsive customer service insures customer satisfaction, , international and expedited shipping available for most items . Fine. Arrow Books. PAPERBACK. 0099514796 Like New Condition. . Fine. W. W. Norton & Company. Hardcover. 0393088995 Like New Condition. . Fine. Arrow. Used - Like New. Ships from Reno, NV. Book in almost Brand New condition. 100% Money Back Guarantee. Shipped to over one million happy customers. Your purchase benefits world literacy! Arrow Books. PAPERBACK. 0099514796 Brand New ,Original Book , Direct from Source , Express 5-8 Business days worldwide Delivery. . New. New York: Avenel Books. Very Good in Very Good dust jacket. 1983. Hardcover. 0517405385 . Five novels in one reprint volume by the master British humorist. In maroon leatherette-look paper-covered boards with gilt-stamped spine titling. Jacket with Mitchell Hooks rendering of Jeeves-like character on front and back covers. --- A firm, clean, unmarked copy but with touch of yellowing to edges of leaves. Price-clipped dust jacket is bright and otherwise undamaged. ; tall 8vo 9" - 10" tall; 682 pages . Paperback. New. 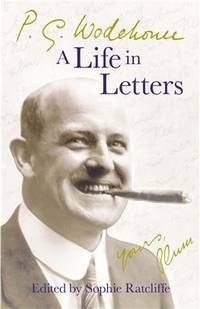 Wodehouse said letters make a wonderful oblique form for an autobiography, and Sophie Ratcliffe's expertly edited collection amply proves the point. (Spectator). One of the funniest and most admired writers of the twentieth century, P. G. Wodehouse always shied away from the idea of a biography. U.S.A.: Avenel Books. 1983 Avenel Books omnibus edition hardback, containing The return of Jeeves, Bertie Wooster sees it through, Spring fever, The butler did it, The old reliable; Very Good, age-tanned but clean book, with Very Good unclipped dj; UK dealer, immediate dispatch . Very Good. Hardcover. 1983. Avenel Books, 1983. Clean and unmarked, VG/VG. Toning to page margins, as usual with this publisher. 682pp. Dust jacket offered in a new mylar cover.. Hardcover. Very Good/Very Good. 8vo - 8" - 9" Tall. London: Weidenfeld & Nicolson, 1982. 1st edition. 399 pp. Illustrated, indexed. Fine / fine dust jacket.. First Edition. Cloth. Books on Tape, Inc, 1983-07-01. Audio Cassette. Good. Avenel Books, 1983-01-01. Hardcover. Like New. Excellent Hardcover in Fine Jacket! Clean, tight and square. Appears to be unused. Prompt USPS Shipping with Tracking.~ "Buy with Confidence, Satisfaction Guaranteed! W. W. Norton & Company. New. Brand New! New dust jacket. New York: Avenel Books. Very Good in Near Fine dust jacket. 1983. First Edition Thus. Hardcover. Tanning to pages. 682 pages. The Return of Jeeves, Bertie Wooster Sees It Through, Spring Fever, The Butler Did It, The Old Relia. Five hilarious novels about the British upper crust -- wonderfully funny tales full of English butlers and Hollywood starlets in the Jazz Age. Two feature the supremely popular Bertie Wooster and his butler, Jeeves. Includes The Return of Jeeves, Bertle Wooster Sees It Through, Spring Fever, The Butler Did It, and The Old Reliable. .
New York: Avenel Books, 1983. Book. Very Good (Book condition). Hardcover. A nice copy, but with tanning to edges of pages. Text clean, binding strong. [Our rating system: 1. Fine; 2. Near Fine; 3. Very Good; 4. Good; 5. Fair.]. New York: Avenel Books, 1983. 5 in 1 omnibus. First edition, first printing Book is in Very Good + condition. Boards have a tiny bit of shelf wear. Fore edges have a small amount of wear. Interior is clean and legible. Not remaindered. Dust Jacket is in Very Good + condition. Tiny bit of shelf wear/rub. Tiniest bit of wear along the edges. Not price clipped. Dust Jacket is covered by Mylar wrapper. Thanks and Enjoy.All-Ways well boxed, All-Ways fast service. Thanks.. First Edition. Hard Cover. Very Good +/Very Good +. W. W. Norton & Company, 2013. 1st printing. Some pale dampstaining to rear jacket panel and board. Unmarked, tight copy. 602pp.. First Edition. Hardcover. Very Good/Very Good. 8vo - 8" - 9" Tall. Hutchinson. Used - Like New. 2012. Hardcover. Fine. Dust Jacket is Fine. Rockville, MD: Author Price Gudes, 1995. 21 clean, unmarked pages; short descriptons of the author's major editions with market prices and a sample autograph. 1st. Unbound. Very Good. 4 Vo; .5 Pounds. Books on Tape, Inc.. Audiobook CASSETTE. 0736639888 Fast handling - Orders prepared for Shipping Next Business Day. . Very Good. W. W. Norton & Company. Used - Like New. 2013. 1st Edition. Hardcover. Fine. Dust Jacket is Fine. Avenel Books, 1983. Hardcover. Good. London, England: Arrow Books, 2013. Softcover. As New/No Jacket. Discount Book: Trade Paperback May contain remainder marks. Arrow Books. Paperback. 0099514796 . New.